June: Protagonist and told from her point-of-view is a teenager in the mid-eighties. She struggles to understand her relationship with her gay uncle, who is slowly dying from AIDS. He is her godfather and the apple of his eye. She is confused about her feelings toward him and whether they are even healthy or normal. They both present a unity that is so magnetic that they can basically communicate without saying a word. 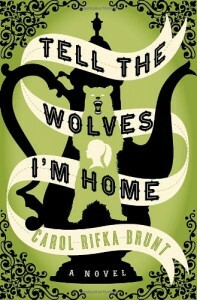 Greta: June's older sister feels that her uncle, Finn, takes away from the closeness that she and her sister once had. Instead of voicing this, she lets her jealousy boil under the surface and it comes across as resentful, detestable, and detached. She feels pressure from her mother to be the perfect child. Without anyone to lean on, she is falling apart and develops a nasty alcohol habit. Finn: Although he isn't alive through most of this novel, he plays a huge role throughout the entire book. It is basically everyone's relationship with Finn that develops the story. Toby: Is Finn's partner of 9 years until Finn's death. June doesn't even know that he exists purely because her mother is jealous of him as she believes that if it weren't for him that she would still be close with her brother. Toby is the one who gets blamed for so much when he is just trying to get by day-to-day. Although he presents himself as nothing much in life, I find him to be one of the most compelling characters. He takes the brunt of Finn's family issues with AIDS, purely because of his love for Finn. I feel that he is so endearing and treats June with so much love and tenderness and always offering support that he nestled his way into my heart. When June's uncle Finn dies, she learns of Toby's existence. Finn left a note for her to take care of Toby and also told Toby to care for June. Although, at times, June is jealous of Toby's relationship with her uncle she has to learn to accept things the way that they are. They also discover how their time together has slowly helped them through their grieving process. June also discovers that although she had never met Toby before, she really had a connection with him after all and didn't even no it at the time. The title of the book is based on a portrait that Finn painted of June and Greta. As time goes by, just about everyone adds a little something to the painting, and I truly think Finn would have liked it that way since he wanted to portray everyone to their core and not superficially. This is basically a story about jealousy, grief, and overcoming deep wounds to see what is really below the strong emotions. It is also a story about healing and forgiveness. I don't know if it is because I would basically be the same age as June in the 80's, but I really connected to June's character. The characters of this novel are wonderfully developed and I felt as though I knew each character individually and could list off every individual idiosyncrasy of their personalities. I was deeply touched by this book and would say that it is definitely one of my favorites.